Do you need to re-take your eye test? You may have had your driver’s licence for a while now, but the chances are that you don’t remember what the eyesight rules are. The DVLA (Driver and Vehicle Licensing Agency) has been running a campaign over the summer to make drivers aware of the rules when it comes to driving and eyesight – and this has been widely reported by the media. To save you trawling through the internet we have done that for you, and set out the rules and requirements, together with what you may need to do. The rules are pretty technical, but you can find the full details on the gov.uk website. There is a quick and easy way to remember them though, and it’s also the best way to test yourself: you need to be able to read another car’s number plate from a distance of 20m. It doesn’t matter if you need glasses or contact lenses to do this, so long as you are wearing them when driving if you do. As well as this, your field of vision needs to be adequate and this is something that you optician can check for you on your next appointment. ‘How far is 20m?’ we hear you ask. Standing by the side of the road, count five parked cars and then read off the number plate of the fifth one. That is an approximate length of 20m. Alternatively, think of it as eight car parking bays away. All learner drivers will need to pass the eye test, and it is something that is checked during the driving test. If a driving candidate is unable to read a number plate from that distance, then the test cannot continue and the examiner is obliged to let the DVLA know. Once the test has been passed successfully, it is each driver’s responsibility to ensure that their eyesight is regularly tested. Many of us may not get around to it as often as we should and it’s not until our eyesight has deteriorated significantly that we do something about it. However, it is worth remembering that it is not just our safety that is at stake, but that of other road users as well – drivers, cyclists, and pedestrians. Why not take the 20m licence-reading test the next opportunity you get? 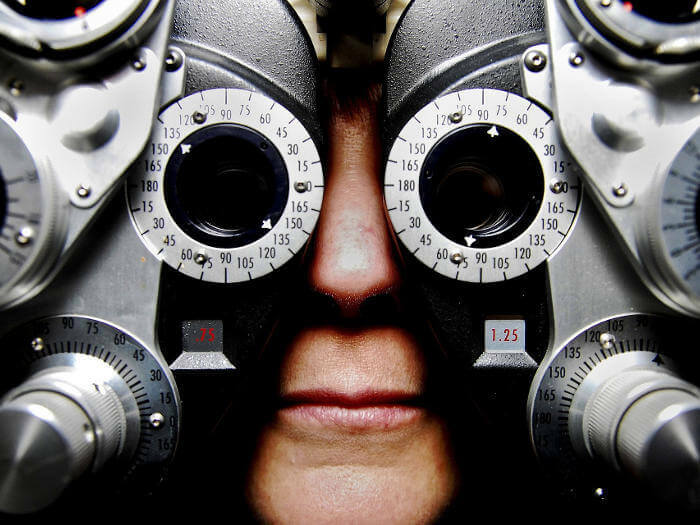 If you have any trouble making it out, make an appointment to see your optometrist. If you are found to be driving with eyesight that is below the required standard then the DVLA can revoke your licence. They can also fine you up to £1,000 if it is found that you are suffering from any medical condition that affects your ability to drive, and this includes any that impact your eyesight. If you are involved in an accident as a result of this, you could even be prosecuted. Don’t delay, check your eyesight as soon as you get the chance. If you want to check your driving skills as well or wish to take a driving course, talk to us at Lanes School of Driving. We have been teaching people to drive for over 100 years and are ideally placed to help you too. Just call us on 020 8166 5678 and we’ll take it from there.